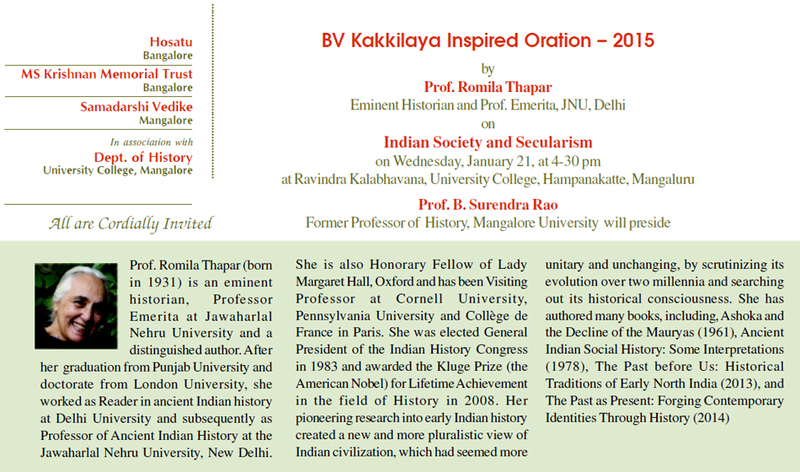 Prof. Romila Thapar, eminent historian, author and Prof. Emerita, JNU, Delhi, delivered the BV Kakkilaya Inspired Oration 2015 titled Indian Society and Secularism on January 21, 2015 at Raveendra Kalabhavana, University College, Mangaluru. 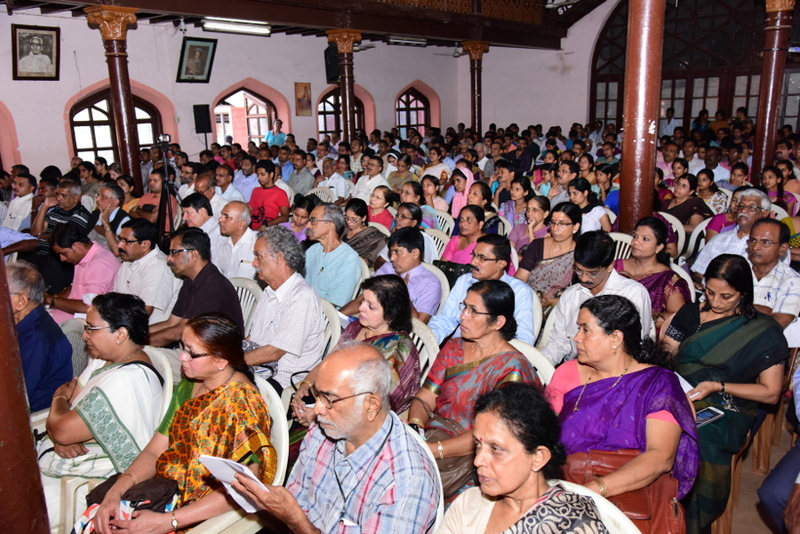 It was presided over by Prof. Surendra Rao, former Professor of History, Mangalore Univeristy. Secularism and democracy cannot be separated, democracy cannot exist without secularism. Secularism means keeping all religions away from the government, most importantly from the judiciary and the laws, as well as from public life. There cannot be mlechs or kafirs in a secular democracy. For a democracy it is essential to understand that the universe functions without any divine intervention and religion must not enter civic society. Laws are made by men and women without the need for any divine sanction. Vedic religion has been evolving and the gods have also been changing – from Indra and Agni to Vishnu and Shiva to many other. The temples emerged by 5th century CE. Before that there were no places marked for worship. Sacrifices and yagas could be performed anywhere. As temples grew, wealth accumulated and they became landlords and businesses. Royal sponsored temples also became centres of power. Conflict between Brahmanism and Shravanism- the worshiping and the working castes existed from pre colonial times. Then came the Bhakti movements which took the gods to the people and worship was in the language of common people. Hinduism has no central dogma, no authority, no central book. Can religion be applied to all aspects of life when different forms of worship exist in different castes? Hindutva is a 20th century invention- the first mention of which is in Anandmath, a novel by Bankim Chand Chatterjee. Today it is being used to create a new paradigm, so to control and can manipulate the religion and to use it for the benefit of a set of people or forces. Islam did not arrive in India through the invading Kings. 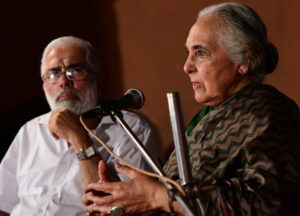 It first came into India, particularly the west coast and Sind, through trade and administrators- Bohras, Khojas and Moplahs are examples of these. They were appointed as ministers by the local kings and there are recorded instances of such ministers providing land to Brahmins for Temple Agraharas. Turks and other Muslims came in as invaders later and they did loot and destroy. Looting of temples was for their wealth and that is why the richest temples were chosen. After the loot, it was claimed to be part of religious action so as to justify it. Temples were looted by Hindu Kings also. 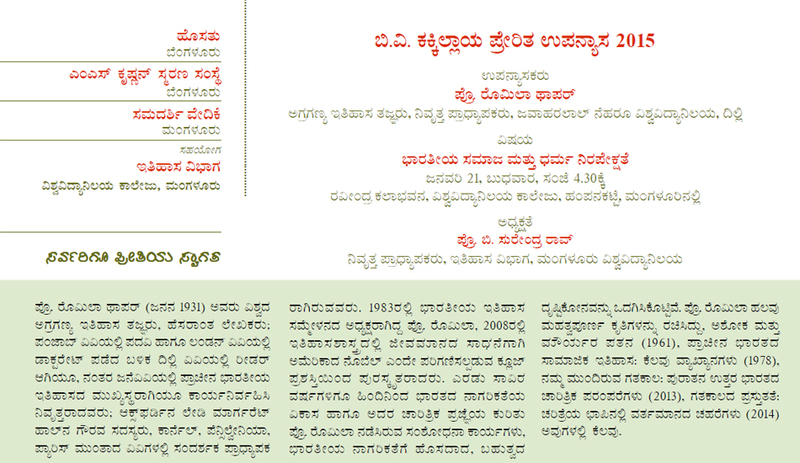 Kalhana’s Rajatarangini of 12th century CE mentions of King Harsha Deva of Kashmir, who appointed officials called as Deva Utpatana Nayakas who were responsible for looting money from the temples to be added to the treasury of the king. Conversions into Hinduism came into practice only in the 20th century, until then one could only be born as a Hindu. 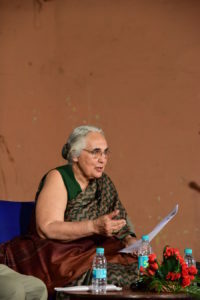 The identity of castes, or such discrimination, is prevalent in all the religions in India. 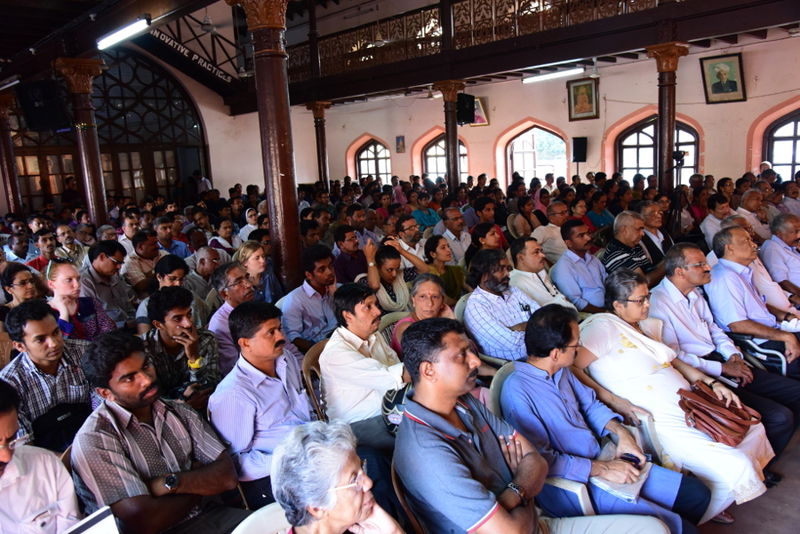 In fact, it is the caste system that is dividing the people of India more than the religions. 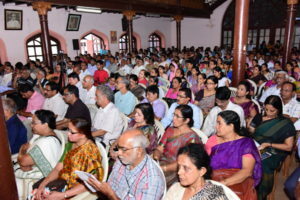 When conversions took place, only the subject of worship changed – the converts carried their castes into the new religion to which they were converted. Reconversion is not addressing this issue at all and the discrimination is bound to continue. How can we encourage secularism – particularly in the society which experiences extremism of religions of Hindus, Muslims and Sikhs and that all religions have a male dominated attitude towards freedom of women? No religious state can be democratic. Secular India means all citizens are governed by the constitution with equal rights and equal status under law. One is free to practice any religion, but that should be personal and private and no religion can be allowed to interfere in the basic fundamental rights of the citizen. There is a need for change in the civil laws; all religions must be kept away from civil laws; the laws of marriage and inheritance should be common for all communities. 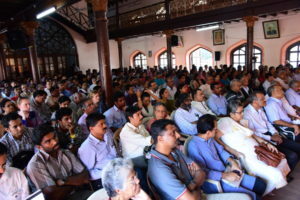 Secularizing the society is not a process of making it anti religion but making it a society where social and political identities are based on citizenship and not on community, religion, language or ethnicity. Secularism is not just keeping religions away, but also abolishing untouchability and discrimination of people in the name of caste. We have to uphold the rights of the judiciary to be independent. Modern education must empower our minds to be secular. If the curriculum is filled with religious and obscurantist ideas, our next generation will find it hard to assimilate with the modern world and their future will be at stake.